Teach your kids to stand up! Should we feed all kids the same amount? It sounds nice, and it’s easy, to dole out the same amount of food to our sons and our daughters, especially if they’re close in age. But what if we’re doing it wrong? Should we be doing what is easiest – or what is best? Men and women have different needs – and so do boys and girls, especially as they reach their teens and go through puberty. Boys and men generally need more food and will almost always need more calories as adults. My son is tracking to be six foot six. As an adult, he’s likely to end up weighing somewhere around 200 pounds and will need about 3000 calories a day – just to maintain his weight. My partner’s daughter, on the other hand, will probably end up around five foot five, needing about 2000 calories a day as a grown woman, just 2/3 of my son’s needs. I might be comparing apples and oranges here But a five foot five man (same as my partner’s daughter) would need 200 calories more than her, all else being identical. If she ate the same amount as either a man her size, or as a man much taller, she would grow wider over time. Much, much wider. I did a lot of sport during my teens and twenties. As a rower, I was training nearly 40 hours a week. I was very active. Then, when I retired from rowing, I got chubby. I watched my diet carefully, but no matter what I did, I struggled with my weight. And I’ve struggled ever since. Here’s the hard truth: men and women – and boys and girls – need to eat differently. According to our needs, not our wants. I’d argue the sexes need to eat from different sized plates, even. And we need to start the habit right from childhood. I’m a feminist. I’m also a scientist. While it’s nice to say that women and men should be treated the same, and receive the same treatment, it just doesn’t hold water when it comes to food. If we receive the same amount, women will put on weight much much faster. We have different bodies, and it won’t do women good to eat the same amount as most men do. Our portions and calories must depend on body size. Feed according to need. Give your kids the food they need, not what they want. If you have a child who is going through a growth spurt, they’ll need a little more. But servings should not be the same. Not unless you have twins. Limit food to meals only. Don’t offer snacks outside mealtimes. Limit junk food. This is a no brainer. Limit junk, for all kids. Limit treats to set days. Friday is our “treat day”. After school we head to McDonalds and get an ice cream or a frozen Coke – the kids can choose. But treats the rest of the time are limited. Don’t serve food “family style”. Serve meals in the kitchen, and have an adult serve the food and control the portions. No “seconds” for girls unless you have an athlete on your hands. If you do have an athlete (which means they’re training HARD 20+ hours a week), make it clear that they will have to reduce their intake when they cease training, and may need professional guidance in doing so. Smaller plates for girls may be an option. Appetizer-sized plates may be an option for getting portions under control. If kids are genuinely hungry offer an extra sandwich AFTER meals or raw sliced vegetables, NOT treats or packaged foods, which can be high in sugar. You’ll soon figure out whether it’s genuine hunger or not! Educate your kids on sensible portions, healthy foods, and what a balanced meal looks like. There are some great resources online. BMI calculator – work out what you should weigh. BMR calculator – work our how many calories you should be eating. No snacks why? And only seconds for a girl if she’s an athlete? So if she isn’t an athlete you tell her “no more food”? That’s so silly; If the food is clean then it shouldn’t have to be limited to only one serving at a time and zero snacks, that’s just cruel. Hi Amanda – There’s good evidence to support restricting snacking between meals, especially as most snack foods (including fruit) tends to be sugar and carbohydrate-heavy. Teaching kids that eating should be based at mealtimes on proper, non-snack foods is a healthier way to base eating habits. Unrefined sugars and carbs are what the brain functions on; If a child is hungry there is no reason not to provide clean, healthy snack for them. When the brain is hungry for long periods of time, especially when it’s deprived of carbohydrates, binge eating occurs. But when we eat frequent, relatively small whole foods based meals throughout our days, we avoid the deprivation that leads to binge eating and metabolism damage. Hi Amanda – I’ve found that providing 3 solid home cooked meals a day for my kids leads to them not needing to snack. Providing extra sandwiches at lunchtimes cured the ‘after school munchies’ and larger dinners with more meat and vegetables ended the ‘late night hungries’. It was amazing how well feeding them properly in the first place solved the snacking issue! As a result, we have 2 teenagers and 2 almost teens who no longer snack – a pretty amazing achievement, if you ask me! ☺ They’re all fit and very active, and rarely get sick (3 of the 4 had zero sick days last school year). They have no pimples and no allergies or health complaints, and excellent food (and staying away from packaged junk) has improved my daughter’s autism dramatically. Our food bill is down too. The proof is very much in the pudding. It’s also much easier and cheaper to prepare 3 proper meals a day than non-stop snacks. Snack food is expensive. The kids have porridge for breakfast (with bacon and eggs or pancakes on weekends), sandwiches and fruit for lunch, and a solid home cooked meal every night. They are thriving. What we are doing works ☺ Cheers. As someone who lived with an eating disorder for 10 years after my mother spent a similar amount of energy monitoring my eating as a child as you do now with your daughters, can I please just say: STOP IT LEE. Love your daughters irrespective of what they look like. Talk to them about everything BUT weight and food. Assume that they are getting more than their fair share of shaming from the media, they don’t need their mother to add to it. Offer them healthy food and activities in abundance. Be a role model when it comes to self-acceptance. I’m pretty sure this advice is lost on you, so I’ll just sit here and wait til your daughters must have hit round about 15 and then sleep easy over the fact that they will make your life a living hell of worry about their puking or starving or binging. I’m not going to attempt to get through to you in one comment, so go right ahead. Don’t get therapy for your own self-loathing and anxiety, give it straight to the next generation. How you’re going, you may even succeed in raising super thin daughters. Oh how thin they will be! Clearly, that’s the main thing that matters to you. 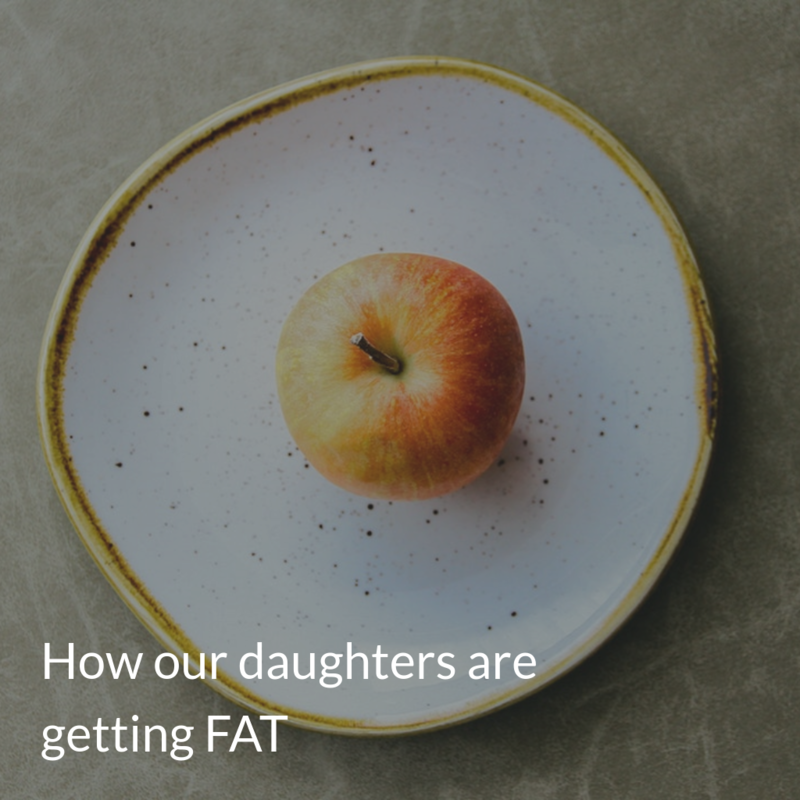 Hi Sarah – Talking about food with our daughters is one of the fundamentals of teaching kids how to look after and respect their bodies. I see it as my responsibility – as a parent – to do that. Healthy eating habits don’t necessarily come naturally, especially in a culture swimming in junk food. By teaching my kids how to eat well, I believe I’m providing them with sensible tools for navigating a fairly hostile and often unsafe / unhealthy food environment. I believe the way I raise my kids is in their best long term interests. You see it as your responsibility to give your daughter a complex about her body? To not trust her own instincts of whether she is hungry or not? To teach her that she only has value if she is thin. It’s important to note that thin and healthy are not the same thing. There are many people out there who are fat but have no associated health problems. Body size is indicated largely by genetics, not by diet. And BMI, which you link to, is an imperfect measure of body size. Don’t know why I’m bothering to respond after you deleted my earlier comment, Lee. What happened to questioning beliefs, being open to the viewpoints of others, and your earlier post championing free speech and decrying censorship. “Should we be doing what is easiest, or what is best?” I guess you prefer to do what is easiest. If you’re going to delete comments, I suggest you also delete that post at the same time. That way, at least, we’ll all know where you stand. Hi Alison – I see we’re going to have to agree to disagree on this one. I do believe that parents (together with support from medical professionals) are the best guides for their children, and that adults are (usually) better judges on what kids should and shouldn’t eat than the kids themselves. If I allowed my daughters (especially my youngest, who has autism) to choose what and how much they eat, she would eat nothing but junk food, and plenty of it! That wouldn’t be in her best interest, and I would be a shameful excuse for a parent if I allowed her to do that. Perhaps you think differently? Most parents are also familiar with having to force their kids to eat veggies when they are young (I certainly am!). This is so they develop the taste for them, and learn to eat healthy foods, not just sweeter, fattier foods. Thin and healthy are absolutely NOT the same thing, but there is an indisputably association between obesity and poor health, which I wish my kids – all of them – to avoid. That’s why I am teaching my kids to eat healthy, and limiting junk food and snack foods in favour of three square meals a day and home cooked meals, both of which are strongly recommended by most GPs and dietiticians. BMI is an imperfect indicator of fatness (I’m assuming this is what you mean in your comment). This is absolutely true. I know this well, as an ex-bodybuilder (and earlier, rower). However, it is a fairly good indicator for most people who are not serious athletes. Most GPs will do further tests for overweight if they have concerns, and not use just BMI. For example, in New Zealand our Maori population generally have larger bones, and their higher weights and heavier bone structure is taken into account by the medical profession when checking their health, as a known variant. When I was bodybuilding, my GP made allowances for the extra weight (in muscle) I was carrying and although my BMI technically moved up into the “overweight” range, he was not concerned and said as much. But most women (and men!) do not carry the sort of muscle I was carrying at the time, and do not increase their weight to that extent, so the BMI is an adequate – and useful – guide. Note I said “guide”. If you have concerns with your weight, my first suggestion would be go see your medical practitioner, which is exactly what I did when I stopped bodybuilding a few years back. Since then I do yearly checkups, as do all my family. That’s just part of looking after our health, and managing our weight is a part of that. Finally, I have addressed your claim that your comment was deleted in my other post. Nothing was deleted, and your abusive tone made an excellent example of my advocacy for free speech (anyone interested – please read my article on free speech and the associated comment from Alison, together with my response). The only comments I ever delete are blatant spam (i.e. links to sales etc.). Yours was not, and therefore was not deleted. I would also like to point out that abusing people online does little for your credibility or to support your argument. Cheers.